What we are calling our toughest project yet! 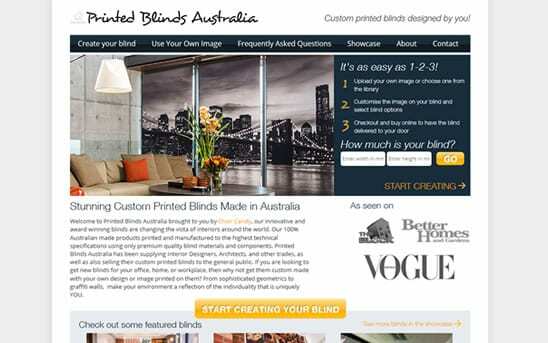 Printed Blinds Australia required a facility for site users to design their own custom blinds online. This had to be easy to use and also work on all devices including mobile. We worked with the client to establish the requirements of the blind designer and how it was needed to work. The site features image galleries, full eCommerce, price estimator calculator and the design your own blind functionality. This project had to be completed in a very tight timescale to coincide with the client getting their blinds featured on “The Block” TV program.